このクイック スタートでは、あらかじめ作成されている 2 つの C# アプリケーションを使います。1 つは利用統計情報を送信し、もう 1 つはハブから利用統計情報を読み取ります。The quickstart uses two pre-written C# applications, one to send the telemetry and one to read the telemetry from the hub. これら 2 つのアプリケーションを実行する前に、IoT ハブを作成し、デバイスをハブに登録します。Before you run these two applications, you create an IoT hub and register a device with the hub. このクイック スタートで実行する 2 つのサンプル アプリケーションは、C# を使って書かれています。The two sample applications you run in this quickstart are written using C#. 開発用コンピューター上に .NET Core SDK 2.1.0 以降が必要です。You need the .NET Core SDK 2.1.0 or greater on your development machine. 複数のプラットフォームに対応する .NET Core SDK を .NET からダウンロードできます。You can download the .NET Core SDK for multiple platforms from .NET. 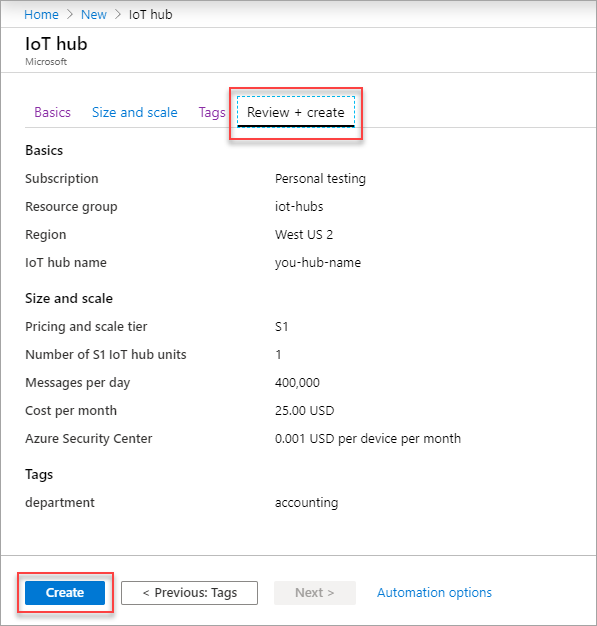 https://github.com/Azure-Samples/azure-iot-samples-csharp/archive/master.zip からサンプル C# プロジェクトをダウンロードし、ZIP アーカイブを抽出します。Download the sample C# project from https://github.com/Azure-Samples/azure-iot-samples-csharp/archive/master.zip and extract the ZIP archive. YourIoTHubName: このプレースホルダーは、実際の IoT ハブに対して選んだ名前に置き換えてください。YourIoTHubName: Replace this placeholder below with the name you choose for your IoT hub. MyDotnetDevice: 登録するデバイスの名前。MyDotnetDevice: The name of the device you're registering. 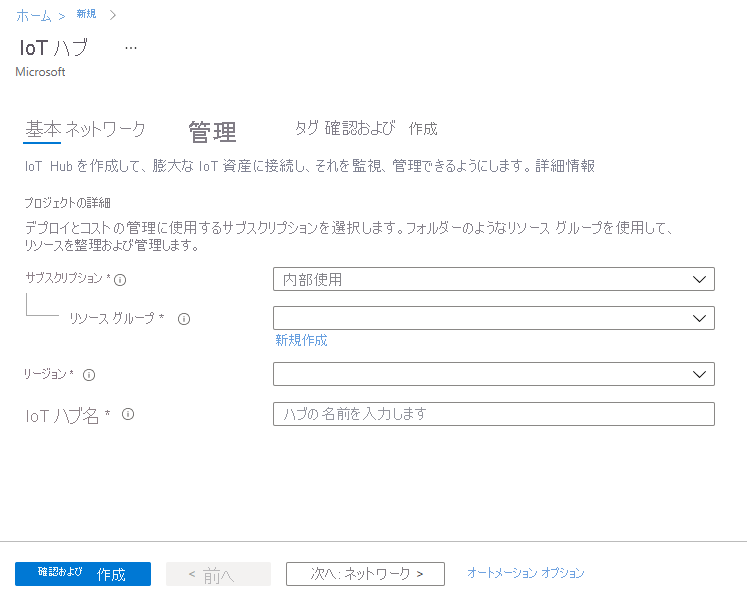 示されているように、MyDotnetDevice を使用します。Use MyDotnetDevice as shown. デバイスに別の名前を選択した場合は、この記事全体でその名前を使用し、サンプル アプリケーションを実行する前に、アプリケーション内のデバイス名を更新する必要があります。If you choose a different name for your device, you need to use that name throughout this article, and update the device name in the sample applications before you run them. クイック スタートの後の方で使うので、これら 3 つの値をメモしておきます。Make a note of these three values, which you use later in the quickstart. ローカル ターミナル ウィンドウで、サンプルの C# プロジェクトのルート フォルダーに移動します。In a local terminal window, navigate to the root folder of the sample C# project. iot-hub\Quickstarts\simulated-device フォルダーに移動します。Then navigate to the iot-hub\Quickstarts\simulated-device folder. 適当なテキスト エディターで SimulatedDevice.cs ファイルを開きます。Open the SimulatedDevice.cs file in a text editor of your choice. s_connectionString 変数の値を、前にメモしたデバイス接続文字列に置き換えます。Replace the value of the s_connectionString variable with the device connection string you made a note of previously. その後、変更を SimulatedDevice.cs ファイルに保存します。Then save your changes to SimulatedDevice.cs file. 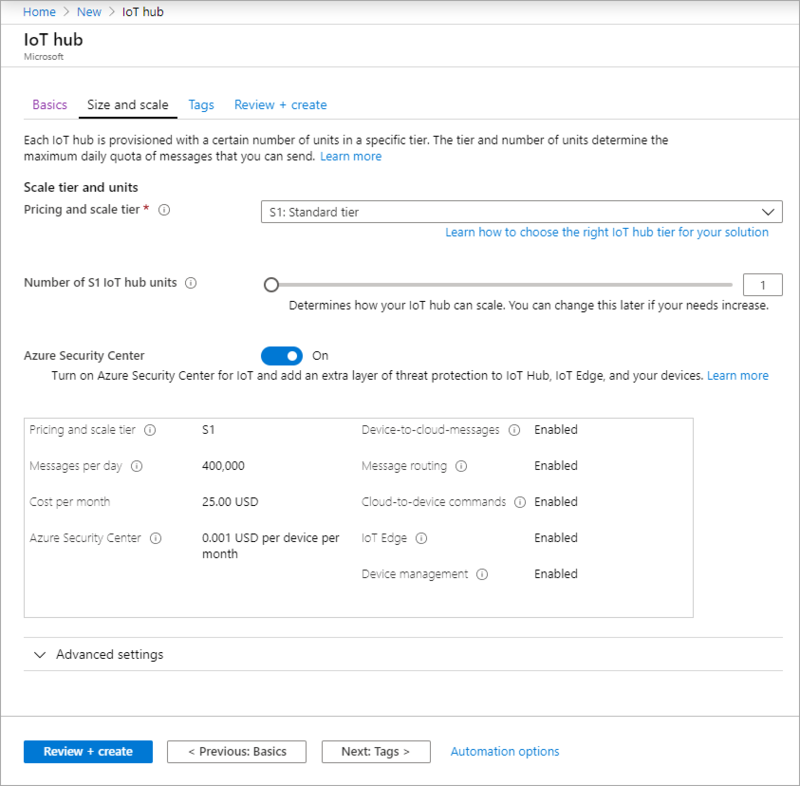 バックエンド アプリケーションは、IoT ハブ上のサービス側 Events エンドポイントに接続します。The back-end application connects to the service-side Events endpoint on your IoT Hub. このアプリケーションは、シミュレートされたデバイスから送信されたデバイスとクラウドの間のメッセージを受信します。The application receives the device-to-cloud messages sent from your simulated device. 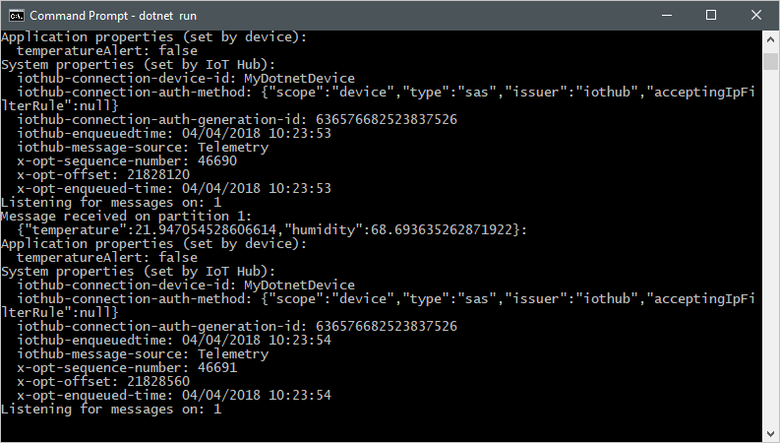 通常、IoT Hub のバックエンド アプリケーションはクラウド内で実行され、デバイスとクラウドの間のメッセージ受信して処理します。An IoT Hub back-end application typically runs in the cloud to receive and process device-to-cloud messages. 別のローカル ターミナル ウィンドウで、サンプルの C# プロジェクトのルート フォルダーに移動します。In another local terminal window, navigate to the root folder of the sample C# project. 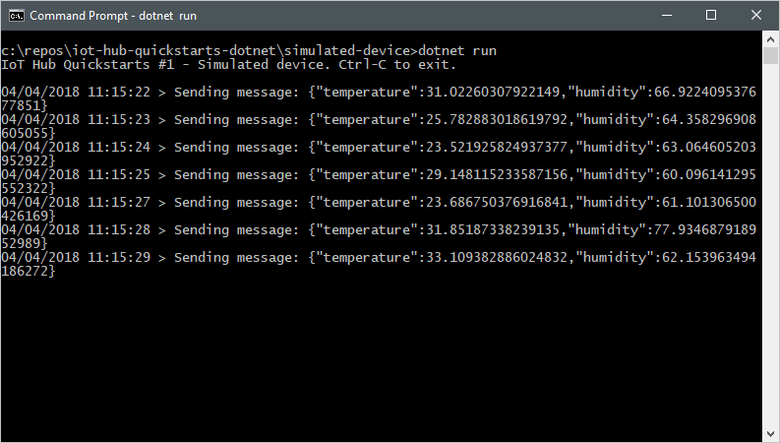 iot-hub\Quickstarts\read-d2c-messages フォルダーに移動します。Then navigate to the iot-hub\Quickstarts\read-d2c-messages folder. 適当なテキスト エディターで ReadDeviceToCloudMessages.cs ファイルを開きます。Open the ReadDeviceToCloudMessages.cs file in a text editor of your choice. 次の変数を更新し、ご自身の変更をファイルに保存します。Update the following variables and save your changes to the file. s_eventHubsCompatibleEndpoint 変数の値を、前にメモした Event Hubs 互換エンドポイントに置き換えます。Replace the value of the variable with the Event Hubs-compatible endpoint you made a note of previously. s_eventHubsCompatiblePath 変数の値を、前にメモした Event Hubs 互換パスに置き換えます。Replace the value of the variable with the Event Hubs-compatible path you made a note of previously. s_iotHubSasKey 変数の値を、前にメモした iothubowner 主キーに置き換えます。Replace the value of the variable with the iothubowner primary key you made a note of previously. このクイック スタートでは、IoT ハブをセットアップし、デバイスを登録し、C# アプリケーションを使ってハブにシミュレートされた利用統計情報を送信し、簡単なバックエンド アプリケーションを使ってハブから利用統計情報を読み取りました。In this quickstart, you've setup an IoT hub, registered a device, sent simulated telemetry to the hub using a C# application, and read the telemetry from the hub using a simple back-end application.